I recently bought a couscousier to try a better way of making couscous at home (more to come on that in future posts). While reading up on different cooking methods for couscous, I've seen a lot of writing on preserved lemons and decided to try my hand at making my own. After scrubbing the lemons, cut half of them into quarters and toss with 1/2 a cup of salt. 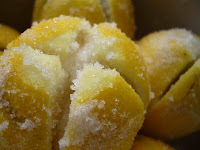 Place 1/4 cup salt in the clean canning jar and add salted lemons. Juice the remaining lemons and mix the juice with 1/4 cup of salt. Pour over slices in the jar. Make sure the rim of the jar is clean and close the lid to form a tight seal. Leave the lemons out on your kitchen counter for the first few days and then move to the refrigerator until three weeks has elapsed. 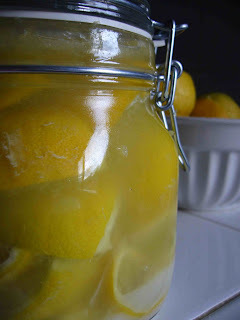 At this point, the preserved lemons should be ready to use. *A little disclaimer: this is my first time making preserved lemons so it's as much of an experiment as anything. I'll post updates over the next three weeks on how they're doing.